Ideal time for visiting is September and first week of October. 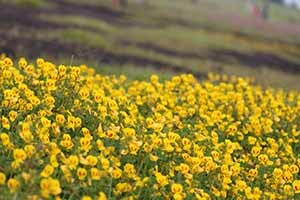 It is declared as a UNESCO World heritage site, situated in district of Satara, approx. 300 Kms from Mumbai & 160 Kms from Pune. We, our Small Steps Adventures Group, started on Saturday night by 9pm in a Tempo Traveler from Swami Narayan Temple, Dadar picking up every participant from various suburbs, last stop being Kalamboli, opposite McDonald’s. By the time, we touched the expressway it was already 10:30pm. We took a halt after Khopoli toll plaza, refreshed ourselves and were again on the road. I was visiting second time with SSA, as it’s an eco-tour near Mumbai & Pune & best place for photography. We reached our Hotel on Sunday by 6am, which was arranged for Breakfast, Lunch and refreshment. To my surprise it was an MTDC resort, which was very clean and beautifully located. After freshening up and having good healthy breakfast, we headed for the plateau by 7am on foot as vehicles have to be parked before entering the premises of the plateau. 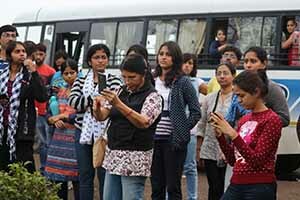 We had arranged a guide to give us brief Introduction about Kaas Plateau, Information about the variety of Flowers, and narrating the story of How Kaas Plateau got the tag of UNESCO World Heritage site. He told us that it’s the best place to visit near Satara which I must say was the sweet truth this time because as we entered the plateau, we were stumped by the beauty and vastness of the area, greenery all around with colorful patches in between & to top it all, the weather was making it mesmerizing, with little drizzles, little sunshine and soothing breeze. The Guide was also explaining details of each and every kind of flowers very elaborately, which was informative and There were watchmen in every section, asking the crowd not to enter certain flowered area as it will get damaged which people obliged. There were also some local people selling Bhakris and Thecha (chopped green chili chutney) which was hot but tasty. 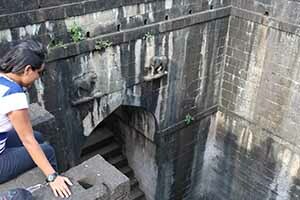 We also found out a water reservoir at the end of the plateau which is supplying water to the Satara residents. The guide mentioned that no machinery is installed near the pond for supplying, only by gravitational force the water is supplied, which in itself is a feat. We explored each and every corner of the plateau, trying to cage the plateau in our camera, filling it with pictures, with videos and by 11:30 am we started our way back to the parking lot to get in our bus. We realized it was perfect time to exit the plateau as most of the people were rushing in and it was getting chaotic at the check-in counter. To find our way to the parking lot and again to get back in the hotel was difficult, thus it took us around 1 hour. By 12:45pm we started our pure veg lunch, which was very dishful and delicious. Puri, Chapati, 2 types of veggies, dal, rice and also sweet, salad & pickles were as good as complimentary. After heavy lunch, we were supposed to head back to Thoseghar waterfalls which is nearby, but due to traffic and crowd, we went to the 12 motechi Wihir (well) in a village called as Limb, near Satara city. It is an ancient step well believed to be constructed in the mid-17th century, which is 50 feet in diameter and 110 feet deep. It still continues to provide water to the nearby farms. We were also fascinated by the fresh vegetables which were sold at cheap prices. After some tea and snacks and some vegetable shopping, we headed back to Mumbai playing non – stop Antakshari, with people from all the age group participating. It was the fun-filled wonderful trip. 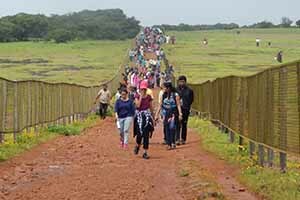 I really felt connected to nature, hence if you are willing to travel a bit and enjoy an eco-tour, you must visit Kaas Pathar – Plateau of flowers. So on Monday, I was very fresh and happy; going to office. After reaching the office, one of my colleagues asked how your weekend was, I said “Kaas – Ekdum Zakaas”.